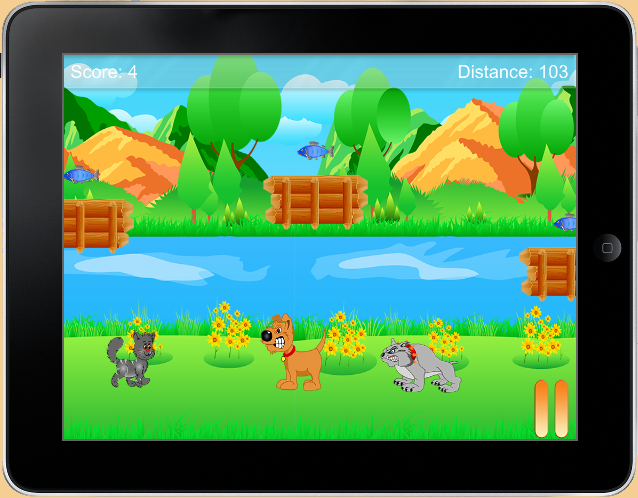 Save the cat from the hideous dogs while running and jumping your way through the game’s interesting graphics. Cat and Dogs is a new jump and run game where players can enjoy fun gaming experience, bright graphics, lively music and infinite fun for hours. The game is as simple and sweet as its name suggests and whether you are a feline lover or not you are bound to enjoy playing it. The rule of the game is simple. You are required to steer the cat through different mazes collecting fishes on the way to nourish your cat while avoiding the two monstrous dogs that are also on trail to get your cat. The game is mostly set in the background of a riverbank and as the game proceeds, you not only enjoy playing it but its background becomes equally involving too. The mazes are designed beautifully to engage players ascending from an easier to harder levels as the game proceeds. The controls of the game are also as simple as it can get. The game is played simply through tapping the jump button. If the cat requires jumping higher than usual, double tapping does the trick. The theme behind the game is to save the cat on its journey from the two dogs while nourishing it with fishes on the way, which by the way also earn points. The exciting part is the challenge and instant hurdles that you have to face while overcoming the dogs on the way. Not only is the game wonderful for small kids, adults can enjoy it too, whenever they are out to have pure fun without involving in any hassle. Although the game is basically designed for amateur and young gamers, however the graphics and design of the game in no sense lack professionalism. The graphics and scenery used in the game is exceptionally involving and the music tops it off attracting the player into the game completely. Who doesn’t love cute jumping cats and barking chasing dogs. 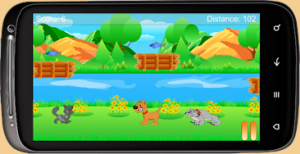 Cat and Dogs is an extraordinary fun involving game that appeal players not only owing to its engaging game play and addicting nature, but the overall package of the game offers pleasurable amusement and entertain you completely. Once you start playing, you never want to stop.